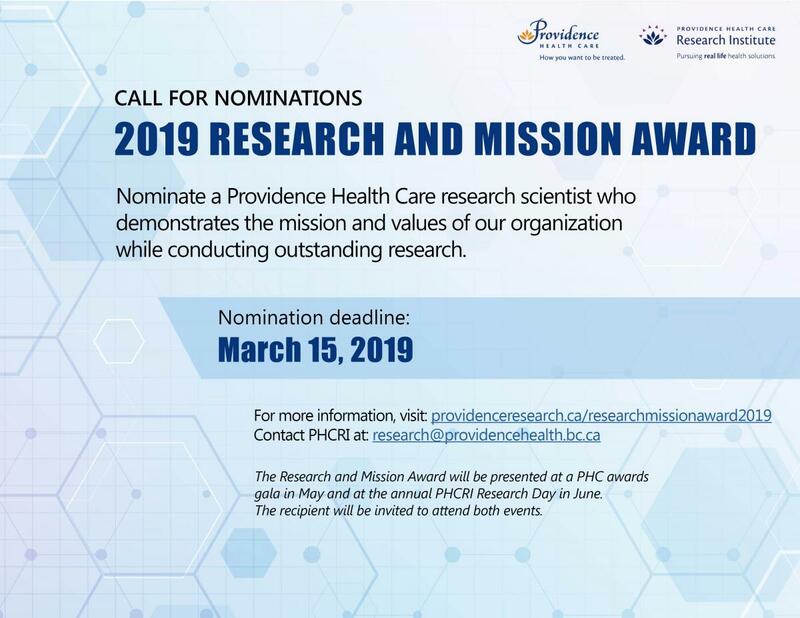 The Providence Health Care Research Institute (PHCRI) and Providence Health Care (PHC) are inviting nominations for the 2019 Research and Mission Award. This award recognizes a scientist in our organization who demonstrates the mission and values of Providence Health Care while conducting outstanding research. This award includes a plaque and $2000 to help the recipient attend an international conference of their choice. The award will be presented at a PHC awards gala on May 24 and at the annual PHCRI Research Day on June 7. The recipient will be invited to attend both events. A researcher who conducts an outstanding research program at Providence Health Care / Providence Health Care Research Institute and exemplifies the mission and values of Providence Health Care. A candidate may be nominated by any individual at PHC and be supported by two PHC staff members – the nominator and two co-nominators. The candidate must be informed of the intent to nominate and must be in agreement. Nomination is accomplished by completing the nomination form, including signatures of the nominee and nominators. The completed nomination form, an abbreviated CV highlighting ten (10) most pertinent publications not exceeding five (5) pages, and a list of previous roles at PHC are to be submitted by the deadline indicated to the Research Facilitation Office (address below). This is a fillable PDF form. Please use Adobe Acrobat or Adobe Reader to complete. Should you experience any technical difficulties, please contact research@providencehealth.bc.ca. Providence Health Care Research Institute at research@providencehealth.bc.ca.